The historical epic Spartacus (1960) is one of the best-known movies in cinema history. It caused a sensation on its release and was one of the most successful pictures of the 1960s. The movie was not only a commercial success it was a critical success, and it received several Academy Awards. Stanley Kubrick directed Spartacus. 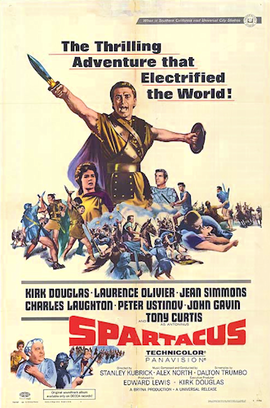 Spartacus had an all-star cast with Kirk Douglas playing Spartacus. The supporting cast was composed of fantastic actors such as Laurence Olivier, Peter Ustinov, Jean Simmons, and Tony Curtis. The blacklisted Oscar-winning screenwriter Dalton Trumbo also scripted the movie. Spartacus is a great movie and still a favorite but how accurate was it? Spartacus was a historical figure who led a slave revolt in the first century BC. This is known as the Third Servile War. Did the Hollywood Epic stay true to the facts or did it distort the truth? Did the makers of Spartacus give us a historically accurate record of the life of this remarkable man or merely gave us a great fictionalized account of his life? Nearly everything that we know about the life of Spartacus comes from Roman histories. According to the Roman historian Appian, Spartacus was a Thracian, a war-like group of people that lived in the Balkans. In the movie, Kirk Douglas character is also a Thracian. However, the movie differs from the historical sources of the early life of Spartacus. In the 1960 picture, Spartacus was born a slave and was descended from a family of slaves. Kirk Douglas's character even states that his grandfather was himself a slave. He is introduced in the movie working in a quarry in North Africa. In reality, Spartacus was born free as a member of the Tharician elite and served as a soldier in the Roman army. Most likely Spartacus fell our favor the Romans and was punished by being sold into slavery. In the picture, he is shown as being bought by Batiatus, the owner of a gladiatorial school. This was historically accurate, but it seems likely that Batitatus bought Spartacus at a slave market. In general, the movie’s account of the early years of Spartacus is inaccurate. The movie gives us a very accurate account of Spartacus time at the gladiator school in Capua. This area was renowned in Roman times for the training of gladiators. The regime at these schools was hard and brutal. The gladiators were driven by instructors and to fight others as part of their training. The Hollywood epic shows Spartacus and the other slaves being brutally treated by Batiatus. This is recorded in the surviving Roman sources. Even by the standards of the time, the owner of the Gladiator School was a vicious master. The motion picture also does not show Spartacus fighting in a gladiatorial contest in the Arena, and this is historically accurate. 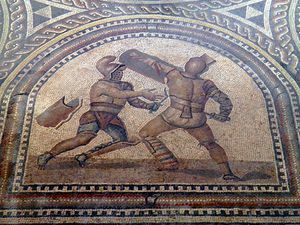 The Thracian never actually fought in a Gladiatorial contest apart from training contests. In one scene Spartacus is forced to fight another Gladiator for the private amusement of some of Batitatus guests, and this was not uncommon at the time. Spartacus is shown in the movie as leading the revolt against Batiatus, and this was the case. He did lead 70 gladiators and inspired them to attack their guards and to make a bid for freedom. The movie accurately shows how the revolt unfolded. It began in the kitchens of the gladiator school when the gladiators seized utensils and knives and used them to overpower their guards and escape. The movie accurately shows how Spartacus and the other gladiators made their escape and set up camp on Mount Vesuvius. Here they are joined by other slaves who escaped from their masters. This is also found in the sources. In the movie, the Romans send a small army to destroy the escaped slaves. Spartacus defeated the Roman force led by the Roman praetor Clodius in the movie, and this is accurate. In Kubrick’s work, Spartacus takes Clodius by surprise and overruns the Roman camps. In reality, Spartacus defeated the praetor on the slopes of Vesuvius by cleverly ordering his men to abseil down the side of the Volcano and thereby outflanking the Romans. This caused confusion and the Romans were forced to retreat. Subsequently, the freed slaves attacked and raided the villas and estates in the area, and they are shown as freeing slaves. This is recounted in the histories. Spartacus and his army devastated this area and it took the region several decades to recover. In general, the battles in the movie are very accurate. Spartacus was considered by the Romans to be a brilliant general and strategist. This is borne out in the movie. The Thracian developed unorthodox tactics and employed guerrilla tactics very successfully. The Roman sources also indicate that Spartacus cleverly used the skills of the freed gladiators to turn the tables on the Romans and this fact is mentioned by the Ancient Greek historian Plutarch. The picture also accurately reflects how the gladiators formed the nucleus of the freed slave’s army. Kubrick’s feature shows how Sicilian pirates betrayed Spartacus at a crucial stage in the revolt. The Romans send several legions to crush Spartacus and his rebellion, and this forced him and his by now an army of ex-slaves into a small area of southern Italy. To escape the Romans, the rebels tried to secure passage to Sicily. The pirates, as in the motion picture, did not keep their side of the bargain. This left Spartacus, and his rebels cornered in southern Italy. Spartacus was left, and extreme disadvantage and they were quickly defeated. The movie is very accurate on the final stages of the rebellion led by Spartacus. However, the movie does not show other very important aspects of the revolt. Spartacus and his fellow rebels made their way to the Alps after defeating a large Roman force and could easily have escaped Italy and the Romans. It seems that the army of rebellious slaves turned back and returned to the south of Italy. It is not clear why they turned back towards southern Italy? If they made it beyond the Alps, they would have been beyond the reach of Rome. It has been speculated that the former slaves feared the barbarian tribes who lived on the borders of Italy. This remarkable episode is not shown in Kubrick’s version of the story of Spartacus life. Then there is the issue of the leadership of the revolt. In the movie, Kurt Douglas is shown as the unquestioned leader of the gladiators and slaves. This was not the case, and other former slaves were very influential in the movement. For example, the ex-gladiator Crixus the Gaul was very prominent, and the movie does not show Crixus's role. Perhaps one of the most glaring inaccuracies in the film is its failure to explain how Crixus formed his army and broke away from the main body of the rebels. The reasons for this split are unknown. It's possible that the separation was caused by personal rivalry or tensions between different ethnic groups in the rebel army. In general, the motion picture does accurately portray the nature of Spartacus and the Third Servile War, but it does leave out key events and tends to simplify the revolt. The Roman characters in the movie are often historical. Crassus, arguably the villain of the story was a real-life general and politician and was for a time one of the most powerful men in Rome. Julius Caesar is also a character in the movie, but he is shown as commander in Rome which was not the case. In Kubrick’s work, Gracchus is shown as the opponent of Crassus and a Democrat who was secretly sympathetic to the slaves, there was no such character, and Gracchus who was played by the great British actor Charles Laughton was a purely fictitious character. The movie portrayal of the great rivalry between members of the Roman elite was largely accurate, the Republic was very divided and was riven by factions. The movie portrays Spartacus and his followers as essentially humane and even noble. The ex-gladiators and the other former slaves committed atrocities and were every bit as brutal as their former masters. Once Spartacus forced 300 captured Romans to fight to the death. The movie does not acknowledge the many innocent Romans, who suffered at the hands of the rebellious slaves. Kubrick’s movie pays a great deal of attention to Spartacus relationship with his unofficial wife Varina who is also a slave at the Gladiatorial School owned by Batiatus. In the movie, Spartacus falls in love with her. Later, she fled with him from their master Batiatus and became his companion. Spartacus did have a wife, but we do not know her name, she was a different figure from the character portrayed by Jean Simmons. Spartacus wife was also a Thracian and Plutarch claims that she was enslaved with him. She was a prophet and claimed to be able to see into the future and probably played a significant role in the army of ex-slaves. As a seer, she would have been consulted by the leadership of the slave rebellion, such as on the best strategies to adopt and what would be the outcome of a battle. It also seems likely that Spartacus wife had a following among the rank and file and that she was one of the key players in the rebellion. The wife of Spartacus was a much more complex and significant figure than the character portrayed in the movie. Perhaps one of the most famous final scenes in all cinematic history is those in Kubrick’s Spartacus. In the finale of the motion picture, Spartacus and his army of ex-slaves suffer total defeat at the hands of Crassus. The final battle and its outcome are accurate, and the Romans virtually annihilated the rebels. The 1960 movie shows Spartacus surviving the battle and being taken prisoner, but this depiction is inaccurate. The Thracian was according to several Roman authors killed in the battle. He is reported to have been killed as he led a charge against Crassus and his enemies later identified his body. The leader of the slave revolt died very bravely, and the manner of his death greatly impressed even his Roman foes. The Kubrick picture has Spartacus after the final battle, captured, but his captors did not recognize him and presumed him to be another slave..
Crassus in the motion picture orders the survivors of the rebellion to be crucified all along the Appian way, the main southern highway to the City of Rome. This was recorded in the works of Roman historians. 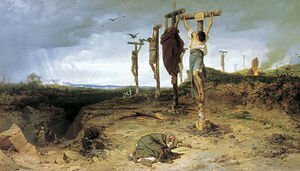 The Romans publicly crucified thousands of men who had joined the rebellion and their bodies left on crosses for months. The movie also shows Spartacus being crucified with his followers. Spartacus was not crucified in real life because he was killed in battle. Crassus knew that the Thracian had been killed and did not try and seek out Spartacus as shown in Kubrick’s movie. The Romans did not need to find out if Spartacus was among their prisoners. Therefore, the most famous scene in the movie where the ex-slaves yell ‘I am Spartacus’ was imagined by the filmmakers. It is important to remember that Spartacus also a critique of the Hollywood Blacklist in the United States. This scene was criticizing people who had collaborated with the Congress group to blacklist actors, directors, writer, and producers in Hollywood for being alleged Communists. Kirk Douglass also used Spartacus as a way to break the blacklist by hiring Trumbo. The "I am Spartacus" was the scene was designed communicate that message. Spartacus is a great movie, but like all Hollywood historical epics, it is not history. The movie was developed by a talented group of people who wanted to entertain, and their priority was to make the motion picture a commercial success. The scriptwriters and directors adopted the facts of the life of Spartacus and turned them into a great movie. They shaped the story of the Thracian and his role in the Third Servile War to meet their own needs, and they also created a Spartacus who had modern values, ones that the real-life Spartacus would never have held. Hollywood in this period was all about glamor, and the picture makers produced a historical epic that still entertains us almost sixty years after it was made. Accuracy was often sacrificed to the need to produce a spectacle. Despite the many inaccuracies in the movie, it is mostly faithful to the story of Spartacus. It could be said that on balance that while the film is not correct, but it is far more historically accurate than the average Hollywood blockbuster. 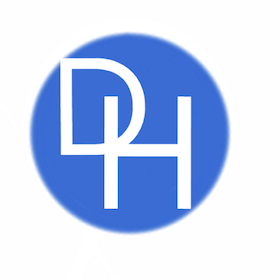 This page was last edited on 6 January 2019, at 19:58.